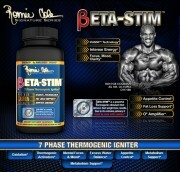 Ronnie Coleman’s Signature Series has been finalising beta testing of his new supplement – Beta Stim. Most likely a pre-workout or intra-workout supplement in pill form. We speculate that the product will contain beta-alanine and some form of stimulant, most likely caffeine, as part of the formulation. Hopefully if all goes well, we’ll be able to see this supplement in stores before the end of this year.